I started off this past weekend trying to tame an antique climbing rose that had been long neglected and was overtaking my porch. Not that I mind roses overtaking my porch usually, but this one has lethally large thorns and was making it where we couldn’t use our porch swing. I’ve never tried to catch five angry cats in a barrel of nails, but that comparison crossed my mind several times while I was untangling the prickly canes! I had scratches all over, but the worst moment was when a branch bounced up and jabbed me directly in the eye. As a certified veteran klutz who’s already experienced a torn cornea, I knew this injury wasn’t serious enough to warrant a visit to the eye doctor, but it was quite painful. I whipped up a quick batch of calendula tea, let it cool a bit and started applying compresses of it to my eye. It started feeling better after the first application and by the time it got dark that night, not a trace of scratchy redness remained. 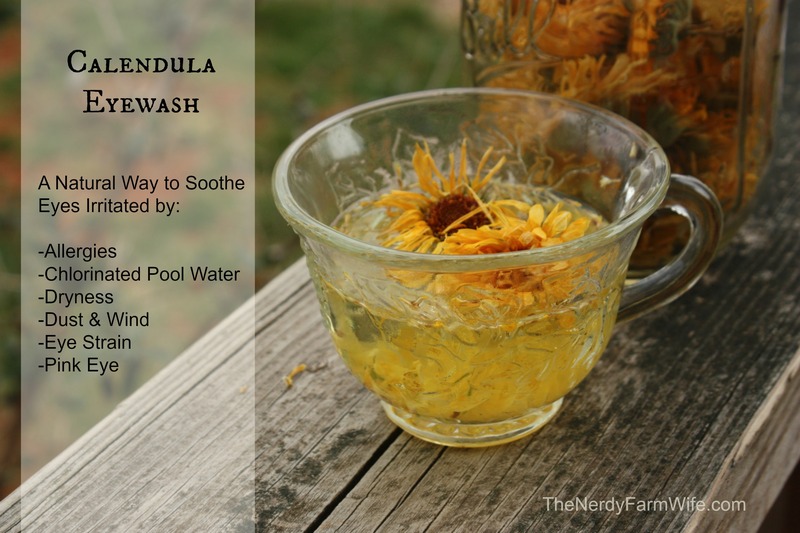 Directions follow on how to make and use your own calendula eyewash. It’s a great natural remedy for irritated eyes caused by: allergies, pool water, dryness, dust, wind, eye strain and even pink eye, but be sure to read the caveats and precautions at the end. Home remedies are great for minor ailments, but if you have: severe eye pain, discharge that is green or yellow, or are diabetic or have other chronic conditions that affect your eyes, it’s always best to seek the advice of a medical professional to be safe. Before beginning, make sure your hands and work area are scrupulously clean. 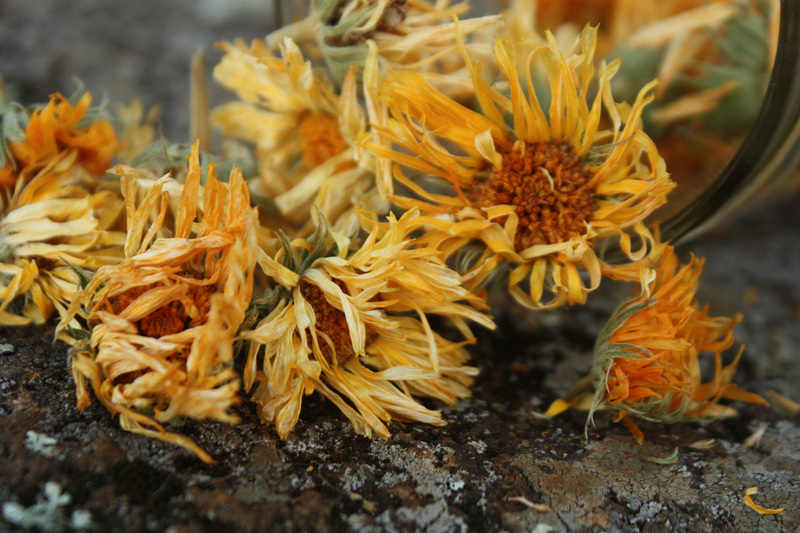 Add a large pinch (tablespoon or two) of dried calendula flowers in a heat proof cup. Pour boiling water over the flowers, cover the cup with a saucer and let steep for 15 to 20 minutes. Strain through a coffee filter to ensure you remove any small particles that could lead to further eye irritation. Dip small, clean cloths into the liquid and use those as compresses on your eye. Squeeze a bit of the tea into your eye if you can tolerate it. It will help heal things up faster. Repeat several times a day, until your eye feels better. Don’t store this tea; make a small, fresh batch each day. Calendula is generally recognized as being safe for external use on most people. It has anti-inflammatory and antiseptic properties. If you’ve never used it before, apply a small bit to a test area of your skin first to make sure you’re not allergic. A special note about pink eye (conjunctivitis): There are two types of pink eye, viral and bacterial. A good indicator of which is which is discharge. In viral conjunctivitis, your eye is watery with clear, thin discharge. In bacterial conjunctivitis, your eye will have a thick, green or yellow discharge. While the viral version can clear up on its own, it’s commonly recommended that you see a doctor for treatment if you have bacterial pink eye. If in doubt, ask your doctor or naturopath. **If you are diabetic, have chronic health problems that affect your eyes, have severe pain or colored discharge from your eyes, seek the advice of a medical professional. Nothing in this post is to be construed as medical advice, but simply a retelling of an old fashioned home remedy that I’ve used successfully for my family. Tagged allergies, calendula, eyewash, pink eye. Bookmark the permalink. Can this be used for a sty on the eyelids? My granddaughter gets them quite frequently. Hi Karen! Calendula is also a recommended treatment for styes. I completely forgot to add that aspect in my post! I’d use the tea on the warm side in this case. Can I use the eye wash on my dog! Yes, you absolutely can! It’s on the ASPCA’s list of non-toxic plants for both dogs and cats. (and for that matter goats do well with it also.) A calendula rinse is also helpful for skin conditions and hot spots on dogs. Ahh, perfect timing! For some reason pregnancy has been making my eyes SO dry and painful. Tonight at dinner I was telling my husband there must be some herb I can use on my eyes to help them, and voila! I come across this. I’m going to check my local store for calendula tomorrow and if not I’ll order the herbs from your link! Thanks a million. “Five angry cats in a barrel of nails”…I’ve not heard that saying before, Jan. Mighty descriptive, I must say! Another informative post. Thanks for sharing! Where can I get seeds to grow my own calendula flower? In the meantime I’m ordering some from online but would love to grow my own to keep on hand as I have sever dry eyes and allergies as well. Can’t wait to see if it helps with the redness of my eyes. Hi, I was wondering if you’ve ever come across a situation similar to mine and the outcome. I was positioning a sago palm in the yard while squatting down, and when I turned it, came up from the side and poked me in the far corner of my eye (the white part), puncturing it. That was 2 days ago. It’s swollen and pooled with blood. It’s slightly irritated, and I think a little more blood may have accumulated since first injuring it. My trusted friend at Bailey’s Naturals told me about the calendula wash, which is what I’ve been doing. She did say the eyes heal rather quickly & the wash will aid in this. I know you recommend a visit to the drs, however, I have no insurance and I’m broke. So, the question is, are you familiar with any similar injuries, and was the calendula wash sufficient to heal the wound? Thanks in advance for your help. Ouch! I can definitely relate to the having no insurance & not being able to afford a doctor. I’m not sure how it works in your area, but in the city nearest to us – you can go to the ER & tell them you don’t have insurance and they will still treat you & will work with you on the bill. (They have discounts depending on income and/or no-interest payment plans.) We’ve had to do that twice over the years. However you decide to treat it, I hope it heals up quickly for you! Hi Greg! The color of your tea depends on your type/color of flowers and how many you’ve added in ratio to the water and also how long you steep it. Sometimes, my tea is darker too. It should still be fine to use, though you may want to water it down a bit more if it seems too strong. I’m visiting your website for the first time and I think it’s just lovely. It’s informative, interesting, and pleasant to look at and navigate. I found my way here by searching for calendula eye compress. I am wondering if it would be safe to use on my four month old infant. Would you use a calendula tea compress on an infant? Are there any potential side effects that you know of? So far it’s just his lower eyelid that is swollen and red. The eye itself still looks ok. Thank you for any thoughts you have, and happy spring! Hi Donald! If your eyes are still blurry after surgery, it sounds like the eye doctor needs to take another look & make sure everything is okay. I hope that they’re feeling better & your vision is restored very soon!